Uncertain with your career? Use this infographic to determine your future. 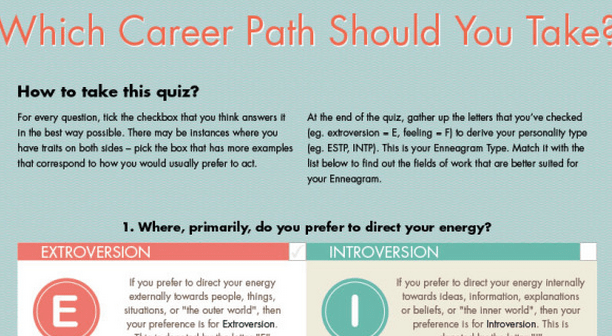 Almost everyone has uncertainties with their career path. Luckily, this useful infographic will guide you through your uninspired and flat career. Don’t give up hope just yet. Simply answer each question with answer you find most suitable. There are 16 possible outcomes for career areas. This is basically a personality test that determines what characteristics are suitable for a career path. Extroverts direct out their energy are generally more suited to social-orientated jobs. This infographic is proof that I’d be an amazing scientist. Being a writer, I got the expected ‘dreamer’ field. Let us know which result you get in the comments below.